Property 1: Lovely modern house w/ balcony in a quiet neighborhood - perfect for day trips! Property 4: New, modern home with a balcony & great neighborhood - perfect for day trips! 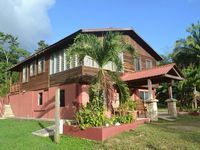 Property 11: Private, cozy, home rental -watch the howler monkeys from your deck ! Property 12: Lovely modern house w/ shared pool, gorgeous views - perfect for day trips! Property 15: Modern home with shared pool, gorgeous views and day trip opportunities! Property 19: Perfect for the whole family! Property 22: Casa Santa Maria - Jungle River Retreat, Off-The-Grid, Seclude Get Away. Property 25: Tropical, riverfront retreat with shared pool & balcony - ideal for day trips! Property 26: Luxury In The Center Of All The Attractions!!!!! Property 30: Deluxe riverfront suite with shared pool, gorgeous views - ideal for day trips! Property 32: Two riverfront dog-friendly suites with shared infinity pool & balcony views! Lower level of new, modern home in a great neighborhood - close to Mayan ruins! Property 38: Lower level of new, modern home in a great neighborhood - close to Mayan ruins! Property 40: Stunning view. Lush Tropical Paradise; Pets OK; Breezy; Creek; Rainforest. Exotic High End Unique Off-The-Grid Treehouse, steps away from the Mopan River! Property 42: Exotic High End Unique Off-The-Grid Treehouse, steps away from the Mopan River! Property 44: Luxury Jungle Lodge with Spectacular Views. Awesome Jungle Garden Cottage riverside in the heart of the Maya Hills ! Property 49: Awesome Jungle Garden Cottage riverside in the heart of the Maya Hills ! Amazing experience! The caretaker and his family were friendly and so helpful. Our kids loved the fact that they had other kids to play with. Domingo was so knowledgable and wanted our stay to be the best that it could be. We even got to see the howler monkeys! The area is nice with a few small corner stores around for essentials (only 10 km drive to everything else you might need). Property was the nicest we saw in the area and is worth the price hands down. We stayed in the upstairs apartment, it was comfortable and inviting. Would stay here again the next time we are in Belize.